Looking for something that shows your love and affection for you near and dear ones? Well then, make sure that they also realise how much you care for their needs and comforts. Why not give them something invaluable like the opportunity to make their own choices regarding their gifts? Give them HyperCity Gift Cards! With indisputable quality, assorted range and hassle-free customer service, HyperCity stands for redefined shopping experience, making us the country's favourite hypermarket. There are numerous products to choose from divided into numerous variety and segregated into divisions. Check out GrabOn for the best offers and deals on HyperCity. Do you need a reason to make your loved ones feel special? And even if there is an occasion, what is better than giving your people the right gift. Something that they will use and need. There is nothing you will not find at HyperCity. Gift Cards by HyperCity will not only make the recipient happy but will also be a major help. If one is to give someone something, it might as well be of something value and use. This occasion, be considerate enough to know the needs and wants of your loved ones and gift them the HyperCity Gift Cards with which they can buy anything from the huge variety of products available at the online HyperCity Store! Why not give your loved ones something they will always cherish? With GrabOb, find the best offers, deals and discounts out there for the Gift Cards offered by HyperCity. Gift someone the joy of choosing their gift! Could anything be better? Happy Gifting! 1. What can I do with a HyperCity Gift Card? 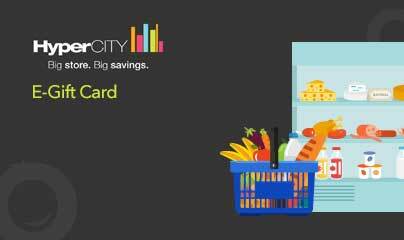 A HyperCity e-gift card is an easy payment option preloaded with money that you can use to buy whatever you want from the HyperCity store. 2. How can I buy a HyperCity Gift Card? The HyperCity gift card will be sent to the respected recipient once your payment transaction is complete. 3. Where can I use my HyperCity Gift Voucher? You can use the Gift Cards at any HyperCity store or on the website. 4. How will I receive my HyperCity Gift Card(s) after purchase? How long is it valid for? You'll receive your HyperCity gift card in recipient's email within 24 hours from the time we receive your payment. Please refer to the terms and conditions to know the validity of your gift card. 5. Can I club any other running offer with my HyperCity Gift Card? Yes. You can avail extra offers and discounts running at HyperCity along with your Gift Card. 6. The transaction failed after I made the purchase. Will I receive the amount that has been debited? Yes, in case of a failed transaction, the amount will be credited to your Gift Card. 7. Where can I contact customer support? In case of queries, you can write to us at giftcards@grabon.in or call us at 7997692233.